Since the Fukushima Daiichi nuclear disaster in March 2011, the Japanese government has been testing robotic technologies to help deal with future accidents. The Hybrid Assistive Limb (HAL) exoskeleton, developed by the University of Tsukuba spin-off Cyberdyne, is being considered for first responders. For protection the suit incorporates tungsten shielding which reduces radiation exposure by about 50 percent, as well as a cooling system to prevent heatstroke. Much of the weight of the suit, including tools used for repairing damaged pipes, can be carried by the exoskeleton’s legs. Vital signs such as heart rate and body temperature will also be measured in real-time. As part of the same initiative, the Chiba Institute of Technology (CIT) is developing remotely-operated robots that can enter radioactive areas. CIT researchers have already built two generations of search-and-rescue robots, which have been tested in annual competitions like the RoboCup Rescuechallenge. Their latest unmanned robot, Sakura, can be used to inspect pipes, radiation levels, temperature, humidity, among other things. It negotiates stairwells and narrow passages by moving on tank-like treads and is equipped with a camera and other sensors. The team expects the robot to be maintenance-free for three years after carefully selecting build materials, which will further help reduce radiation exposure. The New Energy and Industrial Technology Development Organization (NEDO) says the robots will be unveiled to the public in the coming days during Japan Robot Week 2012. In the future a mock-up facility will be built where further research and development can be done. 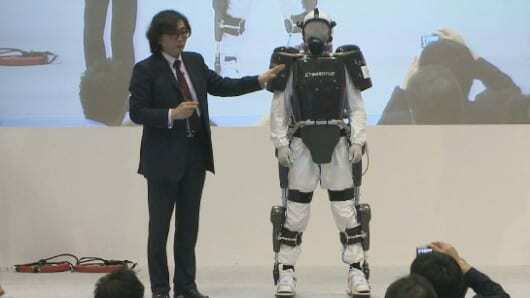 Until now Cyberdyne has marketed the HAL suit as a walking aid (and for rehabilitation), though the company has also shown it with an upper-body extension that multiplies the wearer’s lifting strength by a factor of 10. And, with further miniaturization, it is expected that Sakura may go just about anywhere within a reactor building.